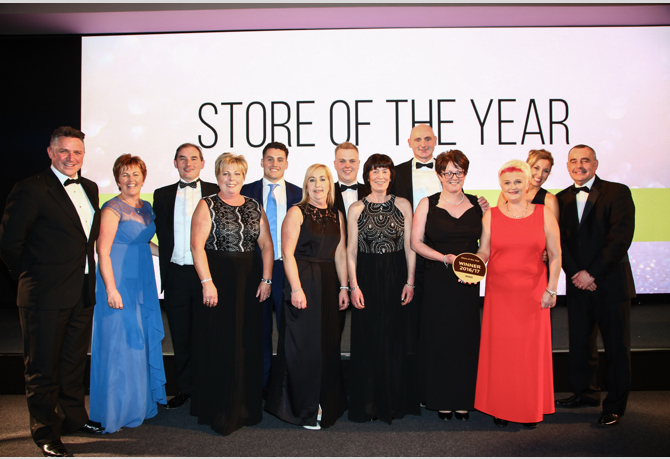 COLLINGWOOD’S Mace, Aghalee has won Mace Store of the Year at Musgrave NI’s annual ‘Store of the Year’ event held recently at the Slieve Donard Resort & Spa, Newcastle. Carl Frampton’s coach and Centra Ambassador Shane McGuigan and TV personality and host Claire McCollum were on hand to congratulate Alan Collingwood and his team on winning Mace Store of the Year, sponsored by Irwin’s Bakery. Musgrave NI organises the Gala Ball event each year for its 230 independent retailers in Northern Ireland across the SuperValu, Centra and Mace brands and finalists were selected following several rounds of performance and standards audits. Finalists in the Mace and Centra retail brands went head to head on the night competing to win Gold in each of their categories, while SuperValu competed for Highly Commended before the coveted ‘Store of the Year’ titles, sponsored by Kerry Foods, Coca Cola HBC Ireland and Northern Ireland and Irwin’s Bakery. Musgrave NI Managing Director, Michael McCormack, said: “Congratulations to all of our 2017 winners - the Store of the Year awards allows us to recognise our retailers who provide outstanding standards in customer service and retail excellence and are driving their brands forward on a daily basis. “The recipients of these prestigious accolades are excelling in the independent retailing market and have embraced the future of retailing across our three brands, SuperValu, Centra and Mace” he added.